The life of international archaeologist Olov Janse (1892–1985) demonstrates the complexity of personal identify formation. Janse worked in Europe, Scandinavia, South East Asia and North America, spoke many different languages, controlled many collections of artefacts, changed identity or character at least five times, and nationality, three times. It is hoped the themes, elucidated through Janse’s story, will encourage comparisons with, and analyses of, the careers of other cosmopolitan archaeologists, and instigate an international history of archaeology focused on mobility, translation and networks, rather than one based on the impact of archaeology on the development of nation-states. This paper proposes comparative outlines for a cosmopolitan history of archaeology, defined primarily by mobility, translation and networks. It intends to complement the history of archaeology’s traditional focus on nation states. Basic historical narratives about the formation of the discipline, as well as critical deconstruction of historical archaeological discourses, have more often than not, been defined by national, or regional borders (e.g. Klindt-Jensen 1975; Arnold 1990). While to some extent reflecting the real importance of archaeology in the construction of nation states or regional identities, it can be argued that this national focus has also become a self-confirming, but inadequately examined, tradition, which has contributed to a lopsided image of archaeology as an essentially national enterprise (Kaeser 2002). The term cosmopolitanism has a double signification in today’s cultural analysis. Both meanings relate to the eighteenth century utopian philosophical use of the concept, as a way towards peaceful human coexistence (Kant 2009 (1784); Rorty and Schmidt 2009). In the first, cosmopolitanism retains an earlier connection to a privileged class of mobile, male, bourgeoisie, travelling to and from the capital cities of the Western world during the late nineteenth and early twentieth centuries, with ‘an unpleasant posture of superiority toward the putatively provincial. You imagine a Comme des Garçons-clad sophisticate with a platinum frequent-flyer card’ (Appiah 2006: xi). Yet over the last couple of decades, cosmopolitanism has also been used as a concept to describe the exile, refugee and immigrant as a very different, characteristically un-privileged, but equally extra-national identity. This use of cosmopolitanism appeared as a part of postcolonial theory in the 1990s, and aimed at creating a framework for cultural analysis that privileges place to mobility, and transition and translation, over essence and stability. In the attempt to embrace exile, unprivileged mobility, transition and translation, in a concept with such positive undertones as cosmopolitanism, there is also the ethical ambition to encourage positive coexistence and mutual respect in today’s world. The introduction to the influential book Cosmopolitanism, says in this spirit that ‘... [c]osmopolitanism, in its wide and wavering nets, catches something of our need to ground our sense of mutuality in conditions of mutability, and to learn to live tenaciously in terrains of historic and cultural transition’ (Breckenridge et al. 2002: 4). This combination of cosmopolitanism with ethics later appeared, with renewed force, in the years after 9/11. In one of the most significant, post-9/11, books on cosmopolitanism, Kwame Anthony Appiah writes with the specific aim of opening up the possibilities of the concept, beyond its previous elite connotations, to become a more general way of thinking about identity that contains movement, lack of fulfilment, and multiple affiliations, in order to use cosmopolitanism as a form of contemporary ethics where all humans are responsible for each other (Appiah 2006; but see also Gonzalez Ruíbal 2009 for a different point of view). It is characteristic of this ‘ethical’ use of cosmopolitanism, to firmly dissociate from, or try to ‘clean’, the concept from its previous associations with a privileged, Western, male, bourgeoisie. The two ‘cosmopolitans’ are thereby portrayed as two distinct identities located at the opposite ends of the spectrum, where at one end, the classic cosmopolitan of earlier days has harvested all the fruits of modern capitalism, whereas at the other end, ‘cosmopolitans today are often the victims of modernity, failed by capitalism’s upward mobility, and bereft of those comforts and customs of national belonging’ (Breckenridge et al. 2002: 6). This may immediately sound like the perfect reflection of the social layout of the world today. But adopting such a perpetrator-victim perspective we run the risk of ending up with an unfortunate essentialising view of identity. The real example of Olov Janse’s life and career testifies to the complexity of personal identity formation, and demonstrates that both forms of cosmopolitanism can be useful as templates in a history of archaeology focusing on mobility, translation, and networks. To find theoretical resonance in the case of Janse’s life we will therefore combine Breckenridge’s and Appiah’s influential texts on cosmopolitanism, with Said’s equally influential essay on a privileged and academic, but also traumatic and life-changing, form of exile (Said 2000). Olov Robert Thure Janse was born in Norrköping, Sweden in 1892. Already as a student he had established a lifestyle based on traveling (mobility), language excellence (translation), and supranational alliances (networks), which he maintained for the rest of his life. His first move was within Sweden, from Norrköping to Uppsala, where he studied archaeology, and he began his doctoral work, supervised by the renowned archaeology professors, Oscar Almgren and Oscar Montelius. Janse wrote his dissertation in French, about Merovingian bracteates found in Sweden (Janse 1922). He travelled as much as the situation during World War I allowed, and mostly to Paris, where he eventually got a position as curator at the Musée d’Archéologie Nationale de Saint-Germain-en-Laye, and where he lectured at the Sorbonne and the École de Louvre. He was offered a full professorship at the Sorbonne, but declined because it required him to become French citizen. He returned every summer to Sweden to work for the Museum of National Antiquities (after 2012 this was renamed The Swedish History Museum, in Swedish: Historiska museet) or with friends at excavations. In 1930 Janse married Ronny Sokolsky (1903–2000), who was born in Grodno (then in Poland, now in Belarus) and when she met Janse, was working for the Swedish-Russian Trade Commission in Stockholm. Together they developed an interest in Asia, and in 1934 they embarked on the first of three archaeological expeditions to French Indochina (now Vietnam), where they excavated, travelled and undertook ethnographic research in collaboration with the École Française d’Extrême-Orient (EFEO). Before the last of their three expeditions the Janses were forced, because of political instability in France, to search for funding and support of their archaeology, elsewhere. They found it in the USA at Harvard University. During their third expedition to Vietnam, the outbreak of World War II and a new professional situation in Sweden, forced them to relocate their work to the Philippines, and from there they travelled to the United States where they settled as professional exiles. In the USA they both had careers. Olov worked first at Harvard University and the Peabody Museum in Cambridge, Massachusetts, and later for the Office for Strategic Services (OSS, the US government’s wartime intelligence agency), in the State Department and then at the Smithsonian Institution in Washington DC. Ronny developed her own career at the Library of Congress in Washington DC. They became American citizens in 1948, and at the same time Ronny changed her first name to Renée. In the early 1950s Olov Janse returned Paris to work for, the recently established, UNESCO. His excavation reports from Indochina and the Philippines were published in three extensive volumes with two different publishers, in the USA and Belgium (Janse 1947, 1951, 1958). He also wrote his autobiography in Swedish for a Swedish publisher (Janse 1959). In 1958 he made one last journey to Asia, on a lecture tour to Saigon (then in South Vietnam) and Korea. But for the most part Olov and Renée remained in the USA and fostered their identities as knowledgeable travellers, and international experts, moving in the high social and diplomatic circles of Washington DC, where they ended their lives as wealthy senior citizens. Olov Janse died in 1985, and Renée in 2000. With the concept of situated knowledge as developed in Donna Haraway’s seminal article (1988), we regard Olov Janse’s career as a trajectory, where every moment offers a unique, situated, sum of his previous experiences, corporeality, and direction towards an anticipated future. Along that trajectory we can identify five, more or less, distinct characters that depend on mobility, translation and networks. Olov’s father Thure Janse owned a candy factory and was a member of the wealthy bourgeoisie of Norrköping. The bookseller Johan Nerman, whose sons Ture, Birger and Einar, were slightly older than Olov, and lived in an apartment in the same building as the Janse family, where they all became friends. All three of the Nerman brothers became famous in Sweden later in their careers. Ture was a politician and a socialist journalist, Einar was an artist, and Birger was an archaeologist. They remained friends with Olov Janse for the rest of their lives. It was through his friendship with the Nerman brothers that Olov developed his interests and skills in language and writing. The young boys wrote poems and short texts to each other, and some were published in local newspapers. Olov was very fond of his uncle Otto Janse, who was a renowned archaeologist who specialized in medieval architecture. Ture and Birger Nerman also began to develop an interest in archaeology, and their younger friend Olov followed in their footsteps and enrolled to study archaeology at Uppsala University in 1912. In the autumn of the same year, Olov travelled to Iceland and wrote an extensive travel report of his experiences for his local newspaper, Östergötlands Dagblad. Two years later he made his first journey to Paris. It had a huge and lasting impact on him and marks the beginning of his new lifestyle as an intellectual wanderer (see Figure 1). The Intellectual Wanderer, Paris 1914. Courtesy of the Janse family. His father’s wealth, and position in Norrköping’s upper bourgeoisie, no doubt gave Olov Janse certain freedoms, in terms of income and social standing. He also had linguistic talents, and soon became fluent in French, and started referring to himself as a Francophile. World War I changed the rules for wanderers like Olov Janse, because it was no longer as easy and effortless to travel as it had been. His mother Hilma Wilhelmina died in 1917 and his father married again in 1918, to Signe Karolina, who brought a young son with her from a previous marriage. So Olov’s childhood home and familial relationships also radically changed during this period. He maintained his love for France, and so in 1919, when the political situation stabilized, Janse found ways to combine his archaeological studies in Uppsala with travelling to France, often by writing about travelling. His articles about student life in Paris’ Quartier Latin appeared in Swedish newspapers, while he worked on his doctoral thesis – written in French, but on a topic about, and on archaeological material from, Sweden. By attending lectures and visiting museums en route, he not only increased his knowledge of archaeology and intellectual life across the European continent, but he also communicated this knowledge to the Swedish public, and increased his public profile, through newspaper articles. The intellectual wanderer is characterised by a sense of freedom and youthful curiosity. Direct experiences and knowledge of other national contexts through travelling builds and adds value to this identity. However, the wanderer has no control over institutions or professional resources, nor does he have any restricting obligations. Yet he usually has a secure home to wander away from and return to. The possibility of assuming this identity, in Olov Janse’s case, was intimately linked to his inherited class, since it demands financial resources to support travelling, language skills to enable communications through translation, and a social position to begin his network building. Janses’ second character is defined by the first use of the word cosmopolitan: male, urban, an identity epitomized by the bourgeois academic, writer or artist, floating around in the cities of the Western world (e.g. Appiah 2006: xi). European archaeology was now Olov Janse’s professional field and the focus of his career, but national borders defined his movements and opportunities. In letters to his friends Janse described France as his spiritual homeland (Swedish: ‘min själs fädernesland’) but he was worried about having to make an ultimate choice between Sweden and Swedish archaeology, or France and French archaeology (Riksarkivet: Paris 19-12-1, Box 1, Korrespondens Brev 1, 1897–1922). Soon after he returned to France from Sweden with his new Ph.D. degree, Janse was the first non-French person ever to be appointed as teaching assistant at the Musée d’Archéologie Nationale de Saint-Germain-en-Laye, where he was put in charge of the Scandinavian collections. He was given the opportunity to teach at the École Practiques des Hautes Études, at the Sorbonne, and at the École de Louvre. At this point in his career, Olov Janse is best described as a Swedish archaeologist in France. He was keen to keep his civic bonds to Sweden, and in 1927 declined an offer of full professorship, resisting the necessary naturalisation to become French citizen. His professional methods in archaeology were undoubtedly drawn from his studies and work in Sweden, with a distinct Scandinavian style of excavation and typological analysis, promoted by his influential teachers Montelius and Almgren. His close relationships with Birger Nerman and others who were now assuming positions in Swedish academia, provided him with privileged information about the happenings there, and so he kept a foot in each territory, returning annually for excavations and museum work in Stockholm. From his position at the French Musée Nationale, Janse also had a certain amount of control over resources. He used his French position to arrange exchanges of artefact collections between Paris/Saint-Germain-en-Laye and the Swedish History Museum in Stockholm. The arrivals of such collections in Stockholm, in March 1924 and June 1925, were featured extensively in Swedish newspapers. His new affiliations and lecture series in France were also noted in the Swedish press, and he collected these notices in a large file for newspaper clippings (NAA 1:8). He became a member of the French Société Préhistorique. However, while he got more and more securely established in France, he also kept an eye out for vacant positions in Sweden. The untimely death of his French museum director, and mentor, Henri Hubert, in May 1927, restricted Janse’s influence in Paris and made him even keener to return to Sweden. He started to spend more time there, and his letters reveal an increased focus on Swedish career opportunities. In November of the same year, a new Museum for Far Eastern Antiquities opened in Stockholm. 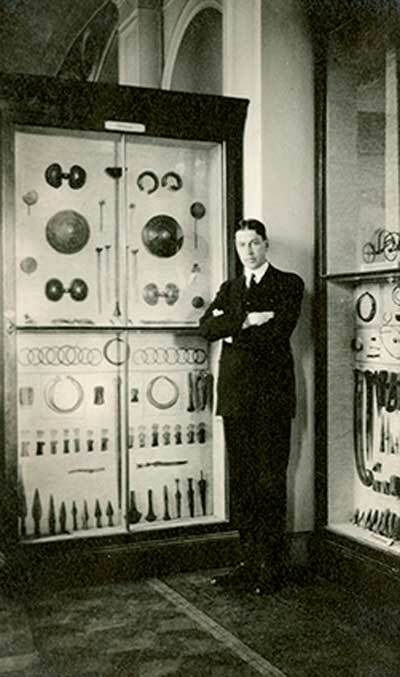 The man behind it was ‘Kina-Gunnar’ – Johan Gunnar Andersson – also known as one of the founding fathers of Chinese archaeology, who filled the museum with his own magnificent collections. Janse became interested in Chinese artefacts (Solheim 1985), but he was still primarily focused on a position at the Swedish History Museum (see Figure 2). In 1929 he was contracted to set up an exhibition of Swedish prehistoric gold there. The exhibition was a great success, and was featured in lengthy extolling articles, not only in Sweden, but also in France and the United States. Olov Janse had now, at the age of 37, made himself a name as a cosmopolitan archaeologist. The Classic Cosmopolitan, Swedish History Museum 1927. Courtesy of National Anthropological Archives, Smithsonian Institution [NAA, 2001:29/998]. Class and prestige are key attributes for the classic cosmopolitan archaeologist. His work is characterized by hungry hunts for funds to maintain a sophisticated, travelling, lifestyle, and to pursue extraordinary professional projects. At this time during the twentieth century it was crucial that a successful cosmopolitan archaeologist be in control of a prestigious artefact collection, to be able to make cultural exchanges, and thereby build networks of influence and obligation. We can see, through the case of Olov Janse, how the control of archaeological artefacts was used as a form of professional capital, and collections became resources, with which it was possible to negotiate and enhance one’s position. Janse’s mobility was now primarily defined by movements between the capitals of France and Sweden, where he built professional networks and used his language skills to blend in, within both contexts, and to enable communications between them. The one stable home he used to have in Sweden was no longer the same after his mother’s death, and his mobility became a constant lifestyle. However, Europe’s colonial empires were now in decline, and the world’s economy was on its way into the Great Depression. This led to turbulent times for archaeologists in general, and in particular, for archaeologists in vulnerable positions. Olov Janse was now married and had teamed up with Ronny, which made it easier for him to pursue larger and more independent professional goals. As his wife she was not only a crucial symbolic accessory to his identity as an expedition director, but like so many invisible archaeologists’ wives she made it practically possible to pursue the work, with her input into excavations, documentation, and the management of artefacts. Ronny’s contributions were no doubt crucial for the archaeological knowledge production that Olov Janse put his name on. From the material we have access to, we cannot see if she actively agreed with all of his conclusions and interpretations, and therefore we can talk only about him, in the cases where we cannot be sure of her contributions. Their first years of married life followed the same pattern as Olov’s last bachelor years. The major difference for them both was the new interest in Asia. In August 1929 Olov Janse was awarded a Swedish scholarship with funding to study Asian influences on the Iron Age Hallstatt Culture of Central Europe. In 1931 he was contracted to study a similar topic in Kina-Gunnar’s collections of Far Eastern antiquities. The early 1930s was a time of intense pro-colonial politics in France. As a last loud breath of its imperial project, the 1931 Exposition Coloniale was staged in Paris. It was a tremendous success. Olov and Ronny visited the Exposition, where Indochina was featured as the pearl of the French colonial Empire, and a full-scale reconstruction of a temple from Angkor Wat was the centrepiece of the exhibition area. The colonies, in particular Indochina, were promoted as the places to be, and archaeology held a central position in the conception of colonial grandeur (Norindr 1996). At around the same time, Olov Janse began to study artefacts from Indochina in the collections of the French Musée Nationale, and to make plans for an archaeological expedition. In 1933 he became the Director of Archaeological Expeditions to Indochina, and funded by French authorities, in October 1934 he and Ronny set out from Marseille on the SS D’Artagnan, bound for Saigon. The expedition was recorded with a new film camera (SVT Archives). The Janses spent six months in Indochina, where they were introduced to the French administration, and to the research institute, the École Française d’Extrême-Orient (EFEO, founded in 1900) in Hanoi, which became their professional base (Clémentin-Ojha and Manguin 2001). They visited famous archaeological sites such as Angkor, and made ethnographic observations of native people in the mountains. They also began archaeological excavations at a site called Dong Son. French colleagues regarded their use of Scandinavian-style excavation techniques as particularly refined, and Olov Janse would later be described as someone ‘who brought order into the archaeology of Indochina’ (Groslier 1966: 160). In his own interpretations of the material he found at Dong Son, Janse saw similarities with European cultures, and he came to the conclusion that there were significant cultural connections between the two areas (Janse 1958). They returned to France in May 1935 with a collection of excavated artefacts that were placed at Musée Cernuschi (founded in 1898 in the mansion of wealthy banker Henri Cernuschi, for his collection of Asian art). Part of the Janse collection was donated to the Swedish Crown Prince (later King Gustaf VI Adolf), on his visit to Paris in October 1935. Olov and Ronny Janse stayed in Europe for a year and a half to work on the artefacts they had brought back, and to plan their next expedition. In the summers they travelled to Sweden to meet old friends. In October 1936 they departed again for Indochina, where they stayed until January 1938. This time they concentrated their archaeological work on excavations of the spectacular brick tombs from the Han period, when northern Vietnam was part of this Chinese empire. Together with Nguyen Van Dong, their colleague from the EFEO, and a local team, they excavated more than a hundred tombs from the Han period, and then in addition, numerous tombs associated with the T’ang and Sung dynasties. During this longer sojourn the Janses were assimilated into the social milieu of the French colony. The colonial archaeologist must be understood in relation to colonial politics (see Figure 3). Olov Janse used his cosmopolitan skills to expand his travels, networks and translations onto a new continent. He and Ronny directly participated in France’s colonial project in Indochina, and they directly participated in the race, class, and gender based power relations that were fundamental to French imperialism. Much of their archaeological work demonstrates how such power relations were taken for granted. Their choice of excavations focused on the ‘Chinese colonisation’ of Indochina by the Han, Sung and T’ang dynasties. They immediately resorted to models of explanation for Indochinese culture and history based on European theories of cultural diffusion, that is, cultural influences, traditions, behaviours and styles originating in a more sophisticated cultural centre, then move to a less complex periphery. The interpretations of their prehistoric work at Dong Son focused on elite males. All of these resonate with French colonial discourse in the 1930s. The Colonial Archaeologist, Thanh-hoa 1936. Courtesy of National Anthropological Archives, Smithsonian Institution [NAA, 2001:29/893]. The image of the archaeologist as heroic coloniser, saving cultural treasures from decay and ignorance, and from local natives’ neglect, also the influence of French colonial discourse, remained a particularly strong message, years after the Exposition Coloniale in Paris. This image was sustained by another one – the triumphant return of the colonial archaeologist – which became something of an Olov Janse speciality. He had already made a number of triumphant returns to and from Sweden and France, and now he returned to France from Indochina, expanding and strengthening his networks, and public profile, by bringing cultural treasures as offerings to national museums. With the outbreak of World War II, Olov Janse’s life and career took a radical turn. Based on his success in Indochina, he had hoped to return to Sweden as the Director of the Museum of Far Eastern Antiquities, after Kina-Gunnar’s retirement in 1938. But during fieldwork in Indochina he received news from Sweden that the position was intended for Bernhard Karlgren, a renowned Sinologist, linguist, and friend of Kina-Gunnar himself. Janse, who saw himself as the perfect candidate for the job, was bitterly disappointed. His plans for a final, triumphant return to Sweden had failed (e.g. Riksarkivet: Buffalo 38-03-21, Birger Nerman, Box 3, Korrespondens Brev III, 1935–1941). Europe was once again on the verge of war, and resources were scarce in France. With the outbreak of the Second World War, the conditions for the cosmopolitan archaeologist would also radically change. Most of the institutions that he relied on were connected with the disappearing colonial system. He had invested nearly all of his networking efforts in a cosmopolitan class of European bourgeoisie who were destined to loose their uncontested positions after the war, if they survived it. New institutions and new political power structures were on their way. Olov and Ronny Janse could not return to France safely, nor to Sweden, because of the war in Europe and in parts of Asia. They decided to travel back from Indochina via Hawai’i to the United States, where they found refuge at the Buffalo Science Museum, in New York state. During his time living in Paris, Olov became acquainted with the renowned Sinologist and Japanologist, Serge Elisséeff, who was now the Director of the Harvard-Yenching Institute in Cambridge, Massachusetts. The Janses renewed this acquaintance, and Elisséeff agreed to fund their third expedition to Indochina provided that his institute would get some of the collection of excavated artefacts in return (Harvard-Yenching Institute: Janse to Elisséeff, 12 February 1938; Cœdès to Elisséeff, 20 July 1938). Once again, Olov Janse used archaeological artefacts as professional capital to support his projects and enhance his own prestige. He and Ronny departed in November 1938 for Indochina, where they resumed, and then finished excavating the Han tombs. As the Sino-Japanese conflict intensified in 1939, the Janses decided to move on to the Philippines, where they met the American anthropologist Henry Otley Beyer, and excavated some hundred tombs associated with the Chinese Ming dynasty (Solheim 1969: 4–5, 1985). With war now threatening more of Asia the Janses were forced to leave the Philippines and return to the USA, via Japan and Hawai’i. However, due to the war their bank accounts, in several different countries, became inaccessible, and they were struggling financially to make ends meet. They had to write to the Nerman brothers in Sweden and ask them to send money for their survival (Riksarkivet: Olov Janse to Birger Nerman, 18 June 1940). After their arrival back in the USA the Janses settled in Cambridge, Massachusetts where Olov found work lecturing at Harvard University, and Ronny was employed as technical assistant for the ‘Harvard-Yenching Institute Archaeological Expedition to the Far East’. In May 1941, only six months after their return from the Philippines, an exhibition of artefacts from their excavations in Asia opened at the Fogg Art Museum. At about the same time Olov was appointed Lecturer of Far Eastern Archaeology at Harvard University, a position that he held for about another two years. A year after the exhibition at the Fogg Art Museum, another exhibition at Harvard’s Peabody Museum, with 7000 objects from the Philippines and Indochina, was opened. Both exhibitions were well received and were widely featured in the media. At the end of 1942, the Harvard-Yenching Institute was struggling to keep paying Olov Janse as a lecturer, and he was recommended to join the Office for Strategic Services (OSS, America’s wartime intelligence agency, the CIA’s predecessor) instead (NA: Entry 92, Box 197. Kennard Rand to Harold J. Coolidge, 24 December 1942). His knowledge of Indochina proved useful to the US intelligence services. In 1943, he became a consultant to the Board of Economic Warfare, and later in the same year he was appointed to a position at Morale Operations (MO) for OSS in Indochina, while Ronny was employed as an OSS biographical analyst. A little later Olov moved to the State Department where he was deputy chief of the South-East Asia section of the Research and Analysis Branch (NAA 1:1; Solheim 1985: 10). They worked for a couple of years for the OSS and the State Department, and during this time Olov wrote at least two anthropological studies on Indochina for intelligence purposes (Janse 1944; Anon. 1945). Olov and Ronny Janse had previously communicated with each other in French, but soon after their arrival in the USA, they started to use both English and French, and then gradually, they switched entirely to English. The only time when Olov communicated in Swedish was in letters to his friends in Sweden. In a letter to Birger Nerman in Stockholm he wrote about plans to come ‘home’ – now with quotation marks. They had settled in the USA but struggled with their health: letters say that Olov suffered from malaria and that Ronny was weak and recovering from surgery (Riksarkivet: Olov Janse to Birger and Barbro Nerman, 20 March 1945). The exiled academic character is defined by its duality. The magnitude of his or her exile trauma is not comparable to that felt by members of large groups of war refugees who are forced to settle without resources, networks, language or civic rights in a new country. But if one looks beyond comparisons of magnitude, there is something significant also in the subtler (but potentially life-changing, see e.g. Said 2000) trauma experienced by the exiled academic. One side of this character has suffered the trauma of the fundamental loss of job, position, community, country, and home to return to (e.g. Said 2000: 179; Trinh 2011), but the other side has enjoyed a privileged creative position with valuable experiences from elsewhere, that have provided them with a plurality of vision and an awareness of simultaneous dimensions. Such pluralities of visions, it has been argued, constituted the building blocks of academia in the USA, and in other intellectual and creative settings in the world after World War II (Said 2000: 173, 186). Exile is intimately connected to language, with its forced separation not only from a native land but also from a mother tongue (e.g. Trinh 2011: 12). But Olov’s and Ronny’s mastery of several languages provided them with additional considerable privileges as a cosmopolitan academic and his competent wife. Exile meant a painful loss of other ways and means of travelling, of language mastery, and networks, but at the same time it was their skilled ability to move, translate and create networks that enabled them to achieve success despite the situation. For Olov and Ronny Janse the duality of the nature of exile meant that they experienced both a privileged creative position and a painful experience of loss, which brought an insatiable hunger for belonging and for recognition. After the war the Janses lived in Washington DC. In April 1946 Ronny got a new position at the Library of Congress, and Olov became involved in the creation of UNESCO, as a member of the Preparatory Commission and a Consultant to the Director General of UNESCO in Paris (Solheim 1985: 11). In 1946 and 1947 Olov spent almost a whole year in Paris without Ronny, and they wrote many long letters in English and French, to each other across the Atlantic (NAA 2:11). In Paris Olov reconnected with some of his shattered professional and social networks, while he also became acquainted with the new world organisation for culture and heritage. He received a United Nations diplomatic passport, and in 1947 he used it on his first brief visit to Sweden in eleven years. 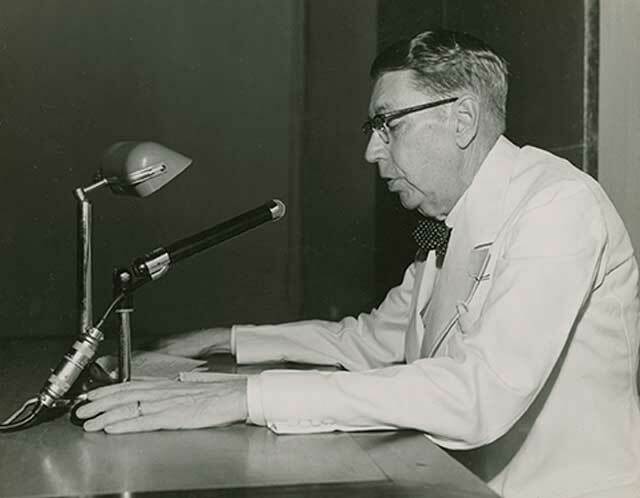 Later in 1947 Olov returned to the USA, and the first volume of his extensive report Archaeological Research in Indo-China was published during the same year. He was once again contracted by the foreign intelligence services and was, from 1947–1955, a Senior Research Analyst for the Foreign Service Institute of the Department of State in Washington DC (Solheim 1985: 11). The Janses became US citizens in September 1948, and at the same time Ronny changed her first name to Renée. In 1950 Olov received a research grant from the State Department to go to Paris for eight months and work on the third volume of his report. The Janses travelled together to Europe where they visited Paris and Stockholm, and a year later Olov published the second volume of Archaeological Research in Indo-China. In the following years they stayed mostly in Washington DC, where Renée worked at the Library of Congress, and Olov worked on the third and last of his report volumes, which was published in 1958, and wrote his Swedish autobiography Ljusmannens gåta – arkeologiska upplevelser i Sydöstasien (Janse 1959). At the end of the 1950s Olov had reached the last major peak of his career. The Janses were actively involved in the highest social and diplomatic life of the capital city of the most powerful nation in the world, and were featured in newspaper articles as a successful couple (e.g. Shumaker 1958). In 1958, as part of the Smith-Mundt Act of public diplomacy, Olov was invited by Vietnamese government authorities to give a series of lectures in Saigon as a Visiting Professor of Vietnamese and Comparative Archaeology (Solheim 1985: 11). On what was to be his last journey to Asia he travelled to Saigon via Europe, India and Pakistan, arriving in October 1958 and staying until March 1959. He gave lectures and was interviewed by newspapers who reported on his importance as an international expert on the archaeology and heritage of Vietnam (see Figure 4). The International Expert, in Saigon, 1959. Courtesy of National Anthropological Archives, Smithsonian Institution [NAA, 2001:29/1835]. Olov Janse’s attitudes to Vietnam had changed in line with his citizenship, and he was now more focused on the role of archaeology and heritage in the postcolonial nation building process. He expressed commitment to the postcolonial future of South Vietnam, against communism and was involved in serious attempts to launch an international salvage programme for the areas that were affected by the United Nations’ sponsored Mekong Valley Development Project (Solheim 1985: 11). His visit was described in newspaper articles as ‘Dr. Olov Janse completes archaeological goodwill mission’ (The Times of Viet Nam, 28-02-1959: 6–7). He returned to the US via Korea and Japan where he also gave a few lectures. On return to the USA Orlov Janse initiated the successful return of 150 artefacts from his excavation collections held at Harvard University, back to the History Museum in Saigon (Peabody: Glen N. Baxter to J. O. Brew, 23 July 1963). Vietnam was now at the top of the list of America’s interest in international politics. In July 1959 Olov Janse spoke about Vietnam on radio on the ‘Voice of America’. He was involved in an exhibition about Vietnamese culture at the Smithsonian Institution, and in Sweden, almost every newspaper positively reviewed of his recently published autobiography (Janse 1959). This was the end of Olov Janse’s professional life. He was awarded many prizes and awards for his work, such as Knight of the French Legion of Honour, and Knight of the Royal Swedish Order of the Polar Star (Kungl. Nordstjärneorden). From 1959 onwards he lived a comfortable life as a man of the world socialising in the upper social strata of Washington DC, sharing his knowledge over cocktails with important politicians, like Richard Nixon, (NAA 4:21) and J. W. Fulbright (NAA 4:21). Renée developed a successful professional career of her own at the Library of Congress, and they posed in photo after photo, as a perfect couple with perfect smiles. At the same time, Olov wrote sad letters to his Swedish friends and Renée wrote dark poetry, speaking of unbearable loss, anxiety, and life fatigue (e.g. NAA 2:25). In March 1985 the 92 year old Olov died suddenly in Washington DC. 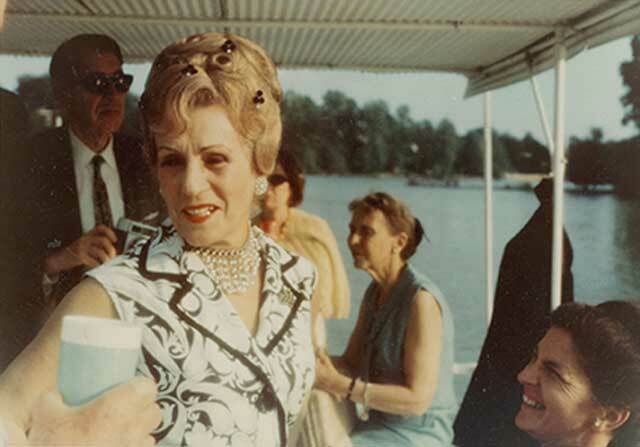 Renée lived to the age of 97 and died in Washington DC in 2000. She bequeathed her estate, worth more than a million dollars, to distant relatives and to cultural institutions in the Janse couple’s native countries, Sweden and Russia. Their personal archive was the only thing that was left in the US, at the Smithsonian Institution’s National Anthropological Archives (NAA: Janse 2001-29). The last phase of Olov Janse’s career was characterised by his identity as an international expert (see Figure 4). Based on his experiences of French Indochina, he was paid for his expertise by American intelligence services and the newborn international organisation UNESCO, in Paris. Although the world map of cultural institutions was radically redrawn after World War II, it is clear that this phase of Janse’s career draws on the three previous phases. He quickly built himself a new professional life in the USA, founded on his experiences from multiple contexts that were the result of his previous travel opportunities and his mobility, his extraordinary capacity to translate and become fluent in different languages, and of course, the professional networks he had built up before the war. Some of his archaeological work from the earlier phases of his career also permeated this phase, with report writing about excavations and exhibitions of excavated artefacts from Indochina. But unlike the previous phases, he no longer had any personal control over collections of artefacts, and the ambitions for personal archaeological acclaim and prestige are gone. His outspoken political ambitions for archaeological narration and displays were also different. The international experts working for new international organisations like UNESCO were there to create a secure and peaceful future for the world, on the basis of what they knew about the past and its cultural heritage. This last phase of Olov Janse’s career and his and Renée’s high society life in Washington DC was featured in media and photographs as a success story. But beneath this surface of affluence and success, their private letters and poetry revealed that there was some physical and mental damage caused by their exile. His detached identity as an international expert on archaeology and heritage, was thus always built on the trauma of exile that eventually lead him to a rebirth of identity as a successful American citizen of the world. In Janse’s archaeological work we have distinguished four recurring themes that create, encourage and/or are dependent on mobility, translation and networks: (i) elite narratives, (ii) artefacts as capital, (iii) identity in translation, and (iv) modern technology. In all of his archaeological work Olov Janse focused on elucidating elite networks and cultural mobility, interpreting archaeology through the theoretical concept of cultural diffusion. His first major study of archaeological artefacts, for his doctoral dissertation (Janse 1922), concentrated on golden bracteates found in Sweden. These were traditionally associated with prehistoric, continental European, elites, and were popular artefacts with early Scandinavian archaeologists, because of their potential for typological studies, such as those pioneered by Janse’s famous teacher Oscar Montelius. Their direct associations with wealth, and their stylistic associations, with continental ruling elites, made bracteates ideal artefacts to use to support narratives emphasising connections between elite classes across Europe. Behind such narratives were ideas about the diffusion of culture from the Mediterranean to Scandinavia. Janse chose to write in French, and his results emphasized connections between the Merovingian (Frankish dynasty AD 500–750) and Scandinavia. While this was a highly unusual choice, both in terms of focus and language, within the context of a Swedish university, it reflected his Francophile interests and ideals at the time, and helped to open doors within the French archaeological community. He maintained his interest and expertise in Swedish gold, and in 1928 he organized a large exhibition on prehistoric gold at the Swedish History Museum. Janse’s second major archaeological study area was the Dong Son culture of Indochina (today in the Thanh-Hoa province of Vietnam). He was interested in finding connections between Dong Son and the cultures of the Classic Mediterranean (Janse 1958). The links between the two were best illustrated, Janse claimed, by a bronze figurine, now on display in the National History Museum in Hanoi, which was evidence of a Dionysian cult at Dong Son. Janse believed that strong cultural elements from the Mediterranean, and in some instances from the Hallstatt Culture of Central Europe, had travelled by means of diffusion to influence the emergence of a parallel culture at Dong Son. The diffusion of ‘advanced cultures’ that could be traced via prestige objects like the bronze figurine from Dong Son, or indeed, via the golden bracteates from his initial doctorate study, was so fundamental to Janse’s understanding of archaeology, that name of the bronze figurine contributed to the title of his Swedish autobiography (Ljusmannens gåta – ‘the candle-man enigma’). When Janse’s reports on the Dong Son excavations were published more than two decades after they had finished (Janse, 1958), cultural diffusionist perspectives were less fashionable in archaeological theory. Postcolonial nation building instead began to have an impact on the interpretation of Dong Son. Today, after the first decade of the twenty-first century, the Dong Son culture has a radically different meaning than the one Janse originally proposed. It is now described as part of Vietnam’s ‘Viking Age’, that is, the Dong Son culture with its famous kettledrums provides evidence of the origins of a strong, independent, Vietnamese people, and is the cradle of the Vietnamese civilization (e.g. Long 2011). The third of Janse’s main study areas, the excavation of the Han tombs of northern Indochina (Janse 1947, 1951), received similar blinkered interpretations by Janse. The Han Empire occupied, what is today northern Vietnam, on three separate occasions, and for over five hundred years (111 BC – AD 544). For Janse the tombs and their contents were perfect examples of the colonial impact of a Chinese cultural elite, and similar to, albeit longer than, the French colonisation of Indochina. With new concepts of cultural interaction in archaeology, the interpretations of the ‘Han’ tombs in Vietnam have been revised to provide more nuanced and detailed discussions of hybrid forms of interaction (Kanji 2005). Olov Janse’s preoccupations with mobile, prehistoric, cultural elites, with vast networks of influence, and with the transmission of cultural expressions over huge distances and between significantly different contexts, such as the Classic Mediterranean and Dong Son, in northern South East Asia, probably had more impact on the reading public than on the academic community. None of his bombastic and limited archaeological interpretations are subscribed to today, but his newspaper articles and his Swedish autobiography were popular. His life and experiences as a member of a pre- World War II, mobile, networked European elite culture are featured in the popular context as a complementary, contemporary, validating, narrative. Throughout most of his career Olov Janse used archaeological artefacts as professional capital, and used the control of artefacts as a professional asset. At the beginning of his career, as an intellectual wanderer, he had no control over any collections, but as soon as he had established himself, as a classic cosmopolitan archaeologist, Janse began initiating exchanges of collections between the Swedish History Museum and the Musée Nationale in Paris. Janse’s name always featured in the Swedish press when the collections from France arrived, and thus provided him with prestige, and increased his public profile, both as the curator-as-hero, and the donor of treasure to the Swedish state. The results of a recent inventory of collections at France’s Musée d’Archéologie Nationale, found that some of the artefacts sent to Sweden, in fact, comprised a private donation that was not supposed to leave the museum. These artefacts were repatriated to Paris in 2012. Janse’s use of artefacts as professional capital intensified when he started to work in Indochina. The prospect of a share in collections of artefacts helped him to find financial sponsors for his expeditions. While the majority of the artefacts he excavated in Indochina remained, in what is now the National History Museum in Hanoi, Janse also sent artefacts to several museums in Paris, Stockholm, and Cambridge, Massachusetts. The arrivals of these collections were featured in the local press, providing Janse with prestige, and a public profile, similar to that of the Paris-Stockholm exchanges, but with more emphasis on the romance, adventure and exoticism of doing archaeology in the East. Before World War II control over important artefact collections was a crucial asset for any archaeologist with an international reputation. The ability to trade, with artefacts as collateral, at the highest levels of cultural affairs and government, enhanced an international archaeologist’s personal prestige, position and power. After World War II, as a consequence of the major reorganisation of many international cultural institutions, this pre-war exchange system was no longer valid. While archaeologists could still influence decisions about the exchange or loans of collections, it was no longer only personal, or about individual or immediate professional capital. During the last phase of his career Olov Janse initiated a final exchange, and returned 150 of his own excavated objects from the Peabody Museum, back to Saigon, in South Vietnam. But unlike previous exchanges, it provided him with no public profile, and no personal prestige. In fact, he was not mentioned in any of the official documents, it was the Directors of the Peabody Museum and Harvard-Yenching Institute who received the publicity and public profile. But ironically, the return of these artefacts did enhance Janse’s reputation as an international expert, unselfishly promoting postcolonial nation building in South Vietnam. Olov and Ronny/Renée Janse were exceptionally good linguists and skilled translators. Between them they spoke a considerable number of languages, and could move with ease between, and across, different language speakers and countries. They not only changed languages, but also their names, according to the situation they were in. Ronny/ Renée was also referred to as Ronja, or Rachel. Olov’s first name in different contexts is spelt Olle, Ollon, Olof, Olav, Olaf, and Alois. While some of the variation in his names (apart from Olov, Olle, and Ollon) seem to have been due to mistakes by others writing about him, Ronny/Renée’s name changes appear to be entirely on her own initiative. Their last name was also written in a number of ways, often on their own initiative: other than Janse, there was Janze, Jansen, Joure, and Jansé, the latter used particularly in French contexts. Translation and adaptation to new contexts was for the Janses their most important facility, and overruled the ‘original’ version of their names. The Janses also used their bodies to make statements about their identities, and photography was important to them. There are thousands of photographs in their personal archives where they pose in different, some almost stereotypical, stances and styles (as the intellectual wanderer, the colonial archaeologist, the international expert, and with his beautiful wife – but not as the exiled academic). Ronny/Renée undergoes, perhaps, the most dramatic metamorphosis at about the same time as she changes her first name to Renée on becoming a successful American citizen. She also leaves her former brunette identity behind, and in photographs from this period, was reinvented as a slim, doll-like, platinum blonde, with perfect hair and stiff smile (see Figure 5). Many of the photographs of Renée from this time were emasculated and manipulated with pens and scissors, no doubt the consequence of her complicated relationship to her own body and appearance and identity (see examples at www.olovjanse.com). Successful American Citizens, around 1965. Courtesy of National Anthropological Archives, Smithsonian Institution [NAA, 2001:29/534]. 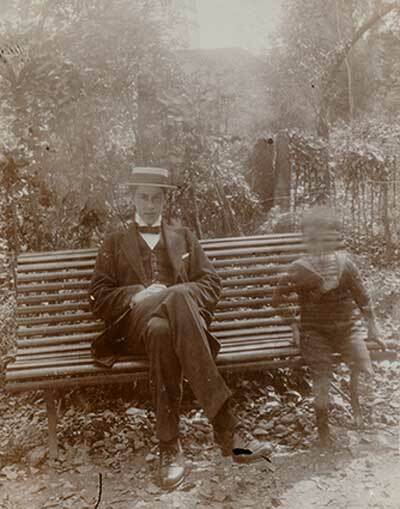 The Janse’s photographs reflect various images of ‘the archaeologist’ in fiction and popular culture. They are connected to contemporary ideas about race, class and gender, and to some degree, are staged by Olov and Ronny/Renée as records of their identity transformations. Through these photographic manifestations of their identity the Janses worked to increase their marketability as cosmopolitan archaeologists, and their handsome and fashionable appearance was often mentioned when they were featured in magazine articles or in other popular contexts. Cosmopolitan archaeologists are dependent on modern technology for efficient travel and communications. Olov Janse always recorded the details of his means of transportation. Beginning with the horse-and-cart, which his uncle Otto used on his church survey tours accompanied by young Olov (Janse 1959), he graduated to the trains and ships that allowed him to travel between Sweden and France, and then to the liner SS d’Artagnan that took Ronny and him to Indochina, and then there were numerous ships to take them to and from Indochina, and to the USA and Asia, and the USA and Europe, until finally aeroplanes took over the transatlantic liner services. The Janses also kept menu cards and other souvenirs from many of their journeys in their personal archive. There are many photographs from both journeys and excavations, and the camera was always an important piece of technical equipment for both activities. When they departed on their first expedition to Indochina in 1934, Olov filmed the journey and their work with his new movie camera. He made a number of such films, which are now kept at the Swedish National Television Archive (SVT Archives). His reliance on what was then cutting-edge technology to keep a record, and to increase the coverage and access to that, was an essentially modern idea, which is something we take for granted in this day and age, but was trail-blazing in his time. With this new technology he was well equipped to pursue an archaeology based on mobility, translation and networks. We have distinguished five different phases, or characters, in the life and career of Olov Janse, that are defined by his own life cycle, as well as by his social and political circumstances. All five comprised travel (mobility), language skills (translation), and supranational alliances (networks) as key elements. The first phase, the intellectual wanderer, was characterized by freedom and youthful curiosity, and archaeology’s contribution to the idea of strong European networks. In the second phase, that of the classic cosmopolitan, Janse built an identity and career on his movements between Sweden and France, and his knowledge of both contexts. He had double affiliations with National Museums in both countries. While his impact in France was mostly academic, he was more well-known in Sweden through his newspaper articles and his celebrated exhibition on Swedish gold. In terms of archaeological knowledge production, Janse’s classic cosmopolitan identity was primarily manifested through his research interests in exchanges of gold and gold artefacts among prehistoric elites across Europe, and in the exchanges of museums’ artefacts that he arranged between France and Sweden. In the third and fourth phases of his life and career, Janse, the colonial archaeologist, becomes Janse, the exiled academic. These two phases were strongly connected to French colonialism, and then to postcolonial upheavals during and after World War II. Janse’s archaeological knowledge production in Indochina supported European colonialism and maintained European cultural superiority, not only through his activities, but also via his interpretations of the history of Vietnam as being an example of cultural diffusion, the simple periphery dominated by the complex civilization centre of China. Through annotated artefact collections, these ideas were realised in museums in Hanoi, Saigon, and in Paris and Stockholm, and the USA. The fifth and last phase of his career was characterised by his role as the international expert. This was an important phase, not only because it was when Janse produced most of his archaeological work, but also because it coincided with a period when most of today’s structures and institutions for international archaeology and heritage management were being established. As Ronny/Renée and Olov Janse were radically changing their identities, settling in the United States, the perameters of Olov’s archaeological knowledge production were also changing, due in part to his seniority, but due also to the new international political order. For a long time the history of archaeology and heritage management have used World War II as a significant dividing line in their narrative: there was before the war and after the war. However, analytical connections between these two periods have, not often, been described or analysed. While not denying the profound ruptures in the international political infrastructure that were the consequences of World War II, it is unfortunate that the historical relationships between supranational organisations like UNESCO and cold war intelligence services on the one hand, and the closely preceding structures of European nationalism and colonialism on the other, are rarely considered. In Olov Janse’s case, we can see how an individual can be a significant participant in these international relationships, first as a colonial archaeologist, and then soon after, as an international expert on culture and heritage, working for both the OSS and UNESCO. The crux in the question of archaeological knowledge production defined by international mobility, translation, and networks is to find ways to understand the importance of nations without treating them as essential units. It would be a mistake, and far too simple, to say that nation states no longer matter. Artefact repatriations to countries of origin are, in fact, more common than ever before, and the recent military conflict between Thailand and Cambodia over the Prasat Preah Vihear Temple is only one case among many, and demonstrates the importance of archaeological heritage to modern nation-state politics. So the nation state must remain a key factor in any cosmopolitan history of archaeology focusing on mobility, translation, and networks. In the concept of the nation we should also include the European colonial projects that Olov and Ronny Janse participated in. Walter Mignolo has rightly argued that all forms of cosmopolitanism, in some way, relate to colonialism or colonial ambitions, and he calls for a profoundly critical approach to cosmopolitanism, particularly when it is used with obvious positive overtones that claim the arrival of a universal human identity along with globalization (Mignolo 2002: 157). All five of Olov Janse’s cosmopolitan identities relate, like Mignolo says, in some way to empires and colonialism. This gives us reasons to remain critical of any triumphalist claims of a cosmopolitan utopia of peaceful global coexistence (Breckenridge et al. 2002: 5; Gonzalez Ruíbal 2009). But this does not mean that cosmopolitan archaeology should be disregarded. The Janse case demonstrates that we ought to resist any easy dismissal of early cosmopolitan archaeology as simply a hobby for the privileged few, and that we should investigate thoroughly how the historical structures of cosmopolitan archaeology relate to today’s international archaeology. 1For further biographic details about Olov Janse and information about the research project we therefore refer to our project website www.olovjanse.com. Harvard-Yenching Institute. ‘Janse, Olov Robert T. Publication Projects and Expeditions’. Cambridge, Mass: Harvard-Yenching Library / Harvard-Yenching Institute Archives. NA. Maryland, USA: The National Archives at College Park. NAA. ’Janse 2001-29’. Washington DC: Olov and Renée Janse’s Personal Archive, at the Smithsonian Institution’s National Anthropological Archives in Washington DC. Peabody. Cambridge, MA: The Peabody Museum Archives. Riksarkivet. Stockholm, Sweden: Correspondence from Olov Janse to Birger Nerman, in the Birger Nerman file at the Swedish National Archives (Riksarkivet). SVT Archives. Stockholm, Sweden: ‘Olov Janses Filmer. 40-05/2112-004 t.o.m. -16; 40-05/2112-017 t.o.m. -20’. Swedish Television Archives (Telearkivet, Sveriges Television). Appiah, K A (2006). Cosmopolitanism: Ethics in a World of Strangers. London: Penguin Books. Clémentin-Ojha, C and Manguin, P-Y (2001). Un siècle pour l’Asie: L’École française d’Extrême-Orient, 1898–2000. Paris: Les editions du Pacifique, École Française d’Extrême-Orient. Cohen, G M and Sharp Joukowsky, M eds. (2004). 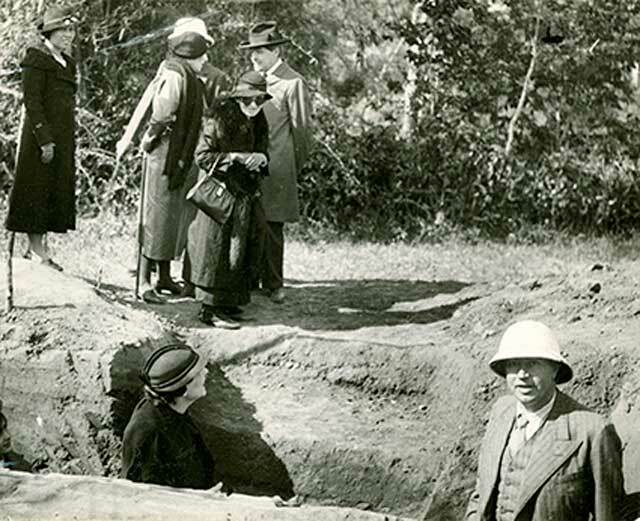 Breaking Ground: Pioneering Women Archaeologists. Ann Arbor, MI: University of Michigan Press. Evans, C (1995). Archaeology Against the State: Roots of Internationalism In: Ucko, P. ed. Theory in Archaeology: A World Perspective. London: Routledge, pp. 312–326. Groslier, B P (1966). Indochina. London: Frederick Muller Ltd..
Janse, O R T (1922). Le travail de l’or en Suède à l’époque mérovingienne: Études précédées d’un mémoire sur les solidi romains et byzantins trouvés en Suède. Orléans: Paul Pigelot & Fils. Janse, O R T (1947). Archaeological Research in Indo-China. Volume I. The District of Chiu-Chen During the Han Dynasty. General Considerations and Plates. Cambridge, MA: Harvard University Press. Janse, O R T (1951). Archaeological Research in Indo-China. Volume II. The District of Chiu-Chen During the Han Dynasty. Description and Comparative Study of the Finds. Cambridge, MA: Harvard University Press. Janse, O R T (1958). Archaeological Research in Indo-China. Volume III. The Ancient Dwelling-site of Dông-so’n (Thanh-Hoa, Annam). General Description and Plates. Bruges: St-Catherine Press. Janse, O R T (1959). Ljusmannens Gåta. Arkeologiska upplevelser i Sydöstasien. Stockholm: Rabén & Sjögren. Kaeser, M-A (2002). On the International Roots of Prehistory. Antiquity 76(291): 170–177. Kanji, T (2005). The Olov Janse Collection. Bulletin of the Indo-Pacific Prehistory Association 25: 139–140. Kant, I (2009). Idea for a Universal History with a Cosmopolitan Aim In: Rorty, A. O. and Schmidt, J. eds. Kant’s Idea for a Universal History with a Cosmopolitan Aim: A Critical Guide. Cambridge: Cambridge University Press, pp. 9–23. (1794). Klindt-Jensen, O (1975). A History of Scandinavian Archaeology. London: Thames and Hudson. Murray, T and Evans, C eds. (2008). Histories of Archaeology: A Reader in the History of Archaeology. Oxford: Oxford University Press. Norindr, P (1996). Phantasmatic Indochina. Durham, NC: Duke University Press. Said, E (2000). Reflections on Exile and Other Essays. Cambridge, MA: Harvard University Press. Shumaker, R (1958). Society: Janses’ D. C. Mode of Life Contrast to Arduous Exploits Abroad. Times-Herald, Washington DC: : 2. Solheim, W G II (1969). H. Otley Beyer. Asian Perspectives XII: 1–18. Solheim, W G II (1985). Olov R. T. Janse 1895–1985. Asian Perspectives XXVI(1): 9–13. Trinh, T. Minh-Ha . (2011). Elsewhere, Within Here: Immigration, Refugeeism and the Boundary Event. New York: Routledge.